Michael Franti headlined Bonnaroo's Which Stage on Friday. 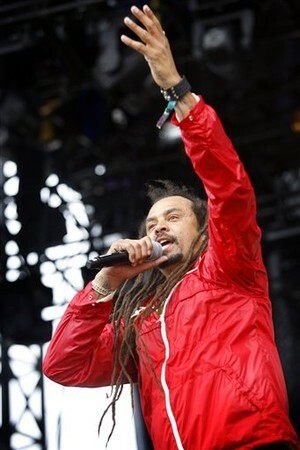 Michael Franti has been making music for a decade now but just recently came to mainstream prominence when his song "Say Hey" received significant airplay in 2009. Now he's got a new album coming out this summer and a new tour that makes a stop at Bonnaroo on Friday evening. Your new album Sound of Sunshine will release this summer. Tell us a little bit about it. Well, I ended up in the hospital last year after my appendix ruptured so every day in the hospital I’d go to my window and look outside and if the sun is shining I’d say, “Yes! It’s going to be a great day.” On days when it wasn’t shining, I’d have to find sunshine somewhere else so I’d pick up my guitar and write songs. And the songs I wrote were songs of bliss and gratitude and songs to get through difficult times. I really wanted to make a record that would be that for other people. Right now is a difficult time in our country and on the planet and I wanted to make a record for when people don’t think there’s any sun in their lives right now, they could put this record on and find it. Sound of Sunshine was recorded in Jamaica. Why Jamaica? We’ve recorded part of our last three albums there. We always work with Sly and Robbie while we’re there. It’s really not so much about the location as about being with those guys. But Jamaica does seep into the record because people are always coming in off the street and listening to the song. You see immediately, do they like the music, are they smiling, are they dancing? It’s a great place to record. What is the biggest misconception that most Americans have of Jamaica? The biggest misconception is that everywhere you go you’re going to hear Bob Marley. *laughs* When you’re in Jamaica, unless you’re in a tourist spot, you don’t hear Bob Marley, you mostly hear dance hall music. The other misconception is that everyone’s smoking weed all the time, which is not true. Right now, Jamaica’s going through a tough time with a lot of political violence on the streets. Jamaica’s a country of great dichotomy. On the one hand you have a tourist industry with great beaches and resorts, but on the other you have such great poverty and the violence that goes along with that. You’ve released two songs off the new album now, “Shake It” and “Sound of Sunshine.” What’s the early feedback you’re hearing? The response has been great. People love the songs, we’re getting more radio airplay than we ever have in the past. It’s been an interesting journey going from a band that never got radio airplay to now being on Top 40 stations across the country. Last year, we had the song “Say Hey” which really blew up. We released the songs in fall of 2008 and it had a little airplay but then went away but in summer of 2009, some stations in the Midwest started playing it and it went crazy and went on to sell 2 million singles on itunes. The songs have been going really well and we’ve had a great time playing the new songs on tour, mostly because the songs were recorded while on tour. We spent February and March on the road with John Mayer, mostly to crowds who have never seen us before, so we’d play the songs on stage and then go back to our little portable recording studio and play with them. So the audience had a real impact on recording this record and the songs are really easy to play live. When is the full album due to be released? Your website is about a lot more than just music. There’s an entire Health and Fitness section as well as a section devoted to some of your favorite causes. What influenced you to grow your website beyond the typical “hype the latest album and tour” site that most successful musicians have? We’ve really grown with our fans over the years and our fans are into more than just music. They want to know about exercise, they want to know how they can help in the world. Many of them have kids that they bring to our shows, so there are generations of fans that grow with us. We wanted to make an interactive community that people can spend time on. Between that and our Facebook page, which I’m really active on, we wanted to make a place there for them to hang out at. You also have a merchandise section. Is that still part of the community atmosphere? Well, I practice yoga every day and we started an organic clothing line of yoga and street wear. The money from the yoga line goes to support a birthing center in Bali. I opened a yoga retreat center in Bali this year and there’s a birthing center near there that we have been buying land for so they can build a new building. You’re playing Bonnaroo this year, a festival you’ve played before. What is it about the Bonnaroo vibe that keeps drawing you back? Well, Bonnaroo has kind of become the granddaddy of all American festivals. The thing I love about it most is that it wasn’t born out of picking the top ten bands off the Billboard chart and creating a festival around it. It was born out of the jam band scene, people who love music for musicianship, they love it for community, they love it because artists sing songs that mean something to them. It has a grassroots feel to it. People come there every year to see their Bonnaroo family. I go there first as a fan. I see new music, but mostly I see new things. People are wearing funny costumes or they’ve built a car that runs on solar energy. It’s always something I’ve never seen before. As a fan, what bands are you most excited about seeing at Bonnaroo this year? We play right before Kings of Leon so I’m excited to see them. Last night my bandmates and I were talking about what Conan O’Brien is going to do there so we’re going to try to check out what he does. Apart from that, I really just love to walk around and see what’s happening. I don’t look at the schedule, I just go from stage to stage and see new stuff. How much material off Sound of Sunshine will folks get to hear at Bonnaroo? About half our set is new music. So 6-7 maybe. Quite a bit of the new album. You can get Michael's two new songs, "Shake It" and "Sound of Sunshine" now through Amazon or itunes. You can see Michael Franti and Spearhead at Bonnaroo on Friday at the Which Stage from 8:00-9:30 PM.